Title: The Hole in our Gospel: What does God expect of us? This book was given to me as a birthday present last year. (Literally 330-odd days ago!) I started reading it on-&-off a few months back and decided to churn through it in recent weeks. I appreciate the gift & plan to use this book as a reference source since it is fully indexed both with scriptural references & topical references. In fact, this book (published in 2010) calls out Joseph Kony & his Lord's Resistance Army, which went viral this year. World Vision (the organization Stearns works for as the president) has been at the forefront of relief efforts in Uganda for a while now. Stearns as an author is fairly dense. He does a nice job interweaving anecdotes with scriptural references and statistics. The chapters in the first few sections are long, and they slowly shorten as his goal changes from information to transfiguration (he ends with a call to action). I give him 3.5 points on my 5-point scale as this read is engaging more because of the real tragedy of his topic than for his ability to weave a story. The illustrations he uses are humble & self-deprecating, while he lifts up positive examples of others. Most of the world lives in extreme poverty. A vast majority of the world centers their daily activities around the things we take for granted. Basic necessities become hazards. For instance: clean water. In order to get enough water to live, families must travel up to 2 hours per day, lugging 10 pounds of water. They exert much more energy than simply turning a faucet. This water is used for everything--drinking, bathing, cleaning, etc. If the physical labor was not bad enough, there is a high likelihood that this water could be tainted, leading to diseases that would threaten the livelihood & lives of family members. The main question that Richard Stearns tackles is: What does God expect of us? Does God expect anything? Does God care about the plight of the poor, or does He only want the gospel preached to them? 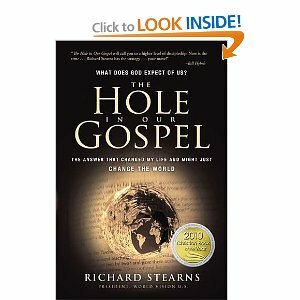 Clearly, Stearns argues that God wants us to have a whole gospel, complete with sound doctrine & real assistance to the poor. Without both, we are just hypocrites who are no better than the Pharisees. When we debate over faith versus works we lose sight of the fact that they are not mutually exclusive. If you are missing one, then you have a hole in your gospel. If the illustration of the tree holds up, we know that good faith is like being rooted in doctrine and works are the fruit. They should both be present in a healthy tree! Finally, Stearns also tackles the question: I am only one person, what can I do? The answer is, You are God's tool. You can yield yourself to Him. That is all that anyone can do. That is all anyone has ever done. He argues that God wants your Time, Talent & Treasure. Give to Him, it is your responsibility. Sometimes having a few extra ordinary men is more important than waiting for that one extraordinary man. Bodies is what God wants. He wants each person to be committed to Him. He wants us to lay down our own perceptions & prejudice so we can see things as He sees them. I can make a personal difference in someone's life today. I do not need to wait for a Billy Graham or Mother Theresa to rise up, I can do something now. I wholeheartedly recommend reading this book. Even more so, I recommend living in a way that reflects the WHOLE Gospel, and not just the parts we find easy to swallow.